Imagining the future of the vast trucking industry that will become autonomous in the coming years. The Nikola One gorgeous, hydrogen fuel cell truck will have a range up to 1,200 miles. The young company plans to begin leasing their trucks by 2020 for about $6,000 a month — including the cost of fuel — but it will first need to build a network of about 400 charging stations throughout the country. Cobmpanies like Walmart are looking to transition to fleets powered by cleaner natural gas, the bridge fuel America has embraced to transition to renewables. That’s where Tesla comes in. Elon Musk, CEO of the electric car manufacturer, plans to unveil an electric-powered semi-truck in the next six months. Battery range will be the biggest obstacle to the widespread adoption of electric trucks as Tesla’s pack will probably only have a 200-300 mile range. The other challenge will be having enough charging stations — and enough power available at each station — to support fleets of Tesla trucks. Cutting the emissions of semi-trucks is great for the environment, but the real cost-saving opportunity lies in cutting out the drivers. It’s been more than a year now since six convoys of semi-autonomous smart trucks arrived at the Netherlands port city of Rotterdam after leaving factories from as far away as Sweden and Southern Germany. That experiment relied on a system called platooning, a semi-autonomous feature allowing trucks to find each other, link up, and draft to cut down on wind drag, saving energy—just like in NASCAR or the Tour de France. And in October, a self-driving truck completed the first commercial shipment by an autonomous vehicle, delivering a load of Budweiser more than 120 miles across Colorado. A human got the truck on the highway and engaged the autonomous system, then climbed out of the driver’s seat. That truck was made by Otto motors, which was recently acquired by Uber. On December 1, 2016, Nikola Motor Company unveiled its electric sleeper semi-truck, the Nikola One. In addition to unveiling the Nikola One, Nikola made several other monumental announcements including: a partnership with Ryder, granting Nikola owners access to their over 800 service and warranty locations across the United States and Canada, 364 planned Nikola Hydrogen Stations across the United States and Canada, a $1 Billion manufacturing facility, the Nikola Shipments software, and The Nikola Two, the electric day cab semi-truck. The semi-truck. Our modern lives are completely dependent on them. Look around you. Every object you see probably traveled on at least one big rig. Here in America, truckers make up 2% of the workforce. But with multiple game-changing technologies converging simultaneously — and the relentlessness of the hyper-competitive global marketplace — the industry will be revolutionized within the next two decades. This is an examination of the future of trucking. Before we get into the technology that will turn it all upside-down, we must first understand the way this extremely fragmented industry works now. To the numbers! There are about 3 million drivers for 2.5 million trucks in the US. Those trucks are owned by 532,000 carrier companies, but 90% of these fleets have fewer than six trucks—and half of all carriers are single individuals who own and operate their own rig. Then you have the middlemen, the freight brokers. These 13,000 companies play matchmaker between the manufacturers and wholesalers (who are trying to get their goods to market) and the retailers (who make the final sale to the consumer). Because this industry is so splintered, there aren’t universal software systems tying it all together. In fact, 67% of shippers don’t use software at all and rely solely on paper records—in 2017! This creates tremendous inefficiency. When every piece of information has to be communicated through human interactions, drivers are frequently forced to wait hours to book or pick-up a load. And sometimes they just don’t, an estimated 20% of trucks on the road are empty. To solve these problems, investors are spending hundreds of millions of dollars on startups competing to develop the silver bullet, a software layer that can be used by every segment of the industry. Another area ripe for modernization is how trucks are powered. Today, medium and heavy duty trucks account for 6% of the greenhouse gas emissions produced in America. To their credit, companies like Walmart are looking to transition to fleets powered by cleaner natural gas, the bridge fuel America has embraced to transition to renewables. That’s where Tesla comes in. Elon Musk, CEO of the electric car manufacturer, plans to unveil an electric-powered semi-truck in the next six months. The Nikola One attempts to overcome these limitations. This gorgeous, hydrogen fuel cell truck will have a range up to 1,200 miles. The young company plans to begin leasing their trucks by 2020 for about $6,000 a month — including the cost of fuel — but it will first need to build a network of about 400 charging stations throughout the country. Cutting the emissions of semi-trucks is great for the environment, but the real cost-saving opportunity lies in cutting out the drivers. It’s been more than a year now since six convoys of semi-autonomous “smart” trucks arrived at the Netherlands port city of Rotterdam after leaving factories from as far away as Sweden and Southern Germany. And dozens of massive, 240-ton trucks are already being used in Australian mines. So that’s the near-future we’ll see in the next 10 years: fleets of driverless trucks. Some will be designed to be autonomous, while others will have the system installed later. Many will be electric, and nearly all will be connected to efficient networks that are not slowed down by frequent human input. Bosch, the German auto components supplier, is partnering with Nikola Motor Co to bring two hydrogen-electric, long-haul, heavy-duty truck models to market by 2021. Introducing the all new Nikola NZT. Toeleverancier Wabco heeft voor 10 miljoen US dollars geïnvesteerd in Nikola Motor Company, het bedrijf dat elektrische en op waterstof lopende trucks op de markt wil brengen. Nikola is van plan eind 2018 te beginnen met het testen van haar emissievrije trucks in vloten van transportbedrijven. Een marktintroductie en serieproductie staat gepland voor 2021. Nikola Motor Company and the Nikola One electric semi-truck are helping Phillips celebrate their 90 year legacy in 2018. Nikola joins with Phillips in saluting the customers who have been with them for the long haul. Behold, the 1,000 HP, zero emission Nikola One semi-truck in motion. Get ready for the pre-production units to hit fleets next year in 2019 for testing. The Nikola hydrogen electric trucks will take on any semi-truck and outperform them in every category; weight, acceleration, stopping, safety and features – all with a 500-1,000 mile range! Andy Christian, Vice President of Nikola Defense, discusses the performance and features of Nikola Reckless, the fully-electric light tactical all-terrain vehicle at the 2018 SOFIC Innovation Showcase held recently at the Tampa Convention Center in Tampa, FL. 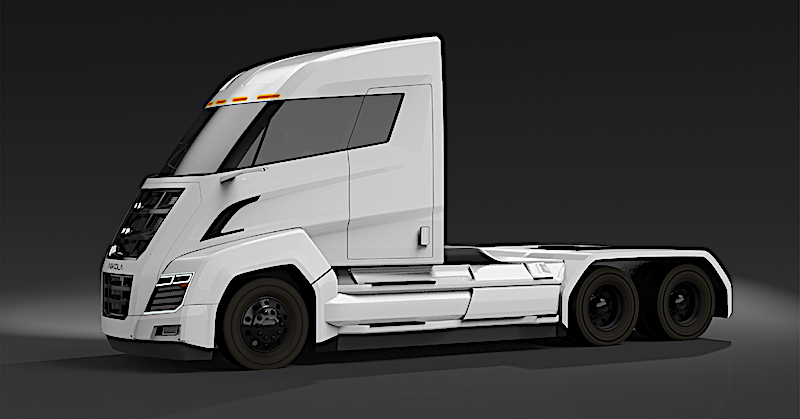 Hydrogen truck company Nikola Motors announced Nikola Two and Nikola Tre would come to market in both a hydrogen and a battery electric build when they are unveiled at Nikola World 2019 next month.